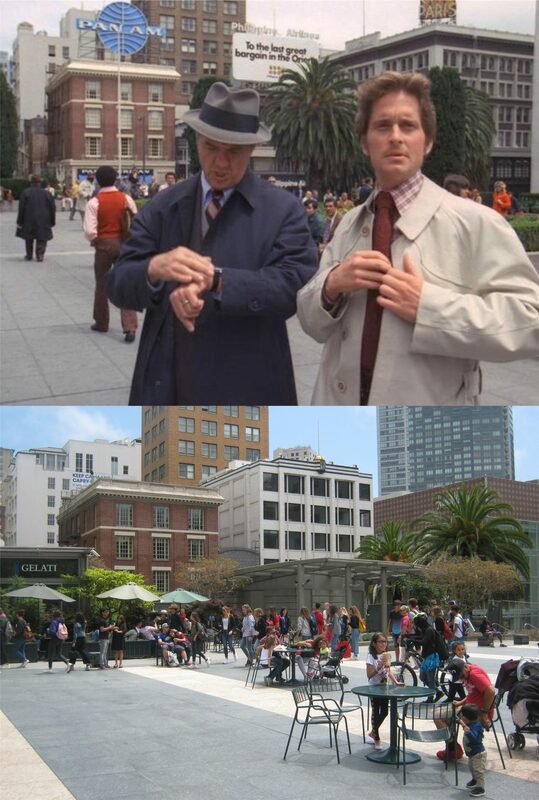 Anybody who loves old movies and San Francisco will probably know what that’s from. Well, we’re into February. My, where has 2019 gone? These are a collection of comparison pictures I took over the last two weekends. I stopped at Union Square on the way home. This San Francisco Chronicle World War Two photo of ladies of the American Women’s Volunteer Services selling war bonds was taken in September of 1942. That’s the Dewey Monument behind them. They’re looking out from above the Union Square Garage entrance on Geary Blvd. When I got back down to Market Street, there was a pro life anti-abortion demonstration proceeding along Market Street that closed the street down from Civic Center all the way to the Ferry building. The vintage photo is a 1967 anti-Vietnam War demonstration in 1967 heading in the opposite direction of last weekend’s turnout away from Civic Center along Fulton Street. In the opening chapter of James and William Belote’s book about the battle of Okinawa, ‘Typhoon of Steel’, the authors write about a three day conference held in the northeast wing of the St Francis in September of 1944 to determine the final campaigns of the Pacific Theater of World War Two; whether the United States would invade the island of Formosa or the islands of Iwo Jima and Okinawa as Admiral Nimitz and General McArthur, who were not at the meetings, had agreed upon earlier in Hawaii. The conference ended with the decision to invade Iwo Jima and Okinawa, so it’s not far-fetched to say that the final agreement that led to these two battles was made in the St. Francis Hotel. Considering the staggering loss of military and civilian life in the battles of Iwo Jima and Okinawa, it will have to be left to posterity to decide if this was the right decision. There’s always the argument that the development of the atomic bombs the following year made the campaigns unnecessary, but no one could have known that at the time. In case you’re not familiar with the title of this post, click on the link below. I know it’s as corny as can be, but it’s still a showstopper!